Which Bits Of London Will Get The Night Tube? London Underground has released the map showing which lines will get the night tube from 12 September 2015. This is what it looks like (click to enlarge). Jubilee line: trains will run on the entire line on average every 10 minutes. Northern line: trains will run on the entire line on average every eight minutes between Morden and Camden Town and approximatively every 15 minutes from Camden Town to High Barnet/Edgware. No service on the Mill Hill East and Bank branches. Victoria line: trains will run on the entire line on average every 10 minutes. Looking at the map, that’s a pretty decent spread across the city unless you live in the south east or north west, in which case you might be using the night bus for a bit longer. TfL says it expects to expand night services to the Metropolitan, Circle, District, and Hammersmith & City lines once its modernisation programmes are complete. The DLR and London Overground won’t get night services until around 2021 and 2017 respectively. Not everyone’s happy about it — last week, the ASLEF union announced strikes on 8 July over a disagreement with LU on pay, and the RMT and TSSA are expected to follow suit. 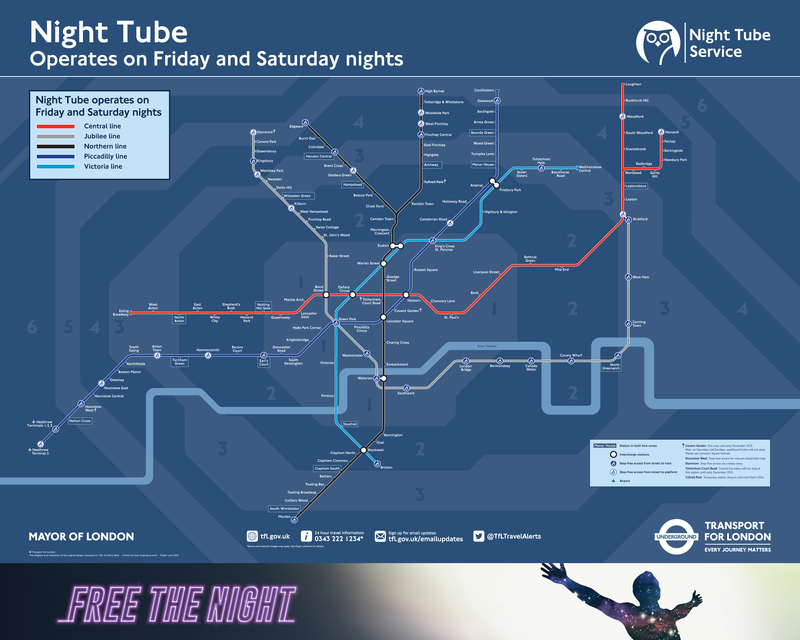 Find out more about the night tube here. ← What Happens If All Three Transport Unions Strike On The Same Day?